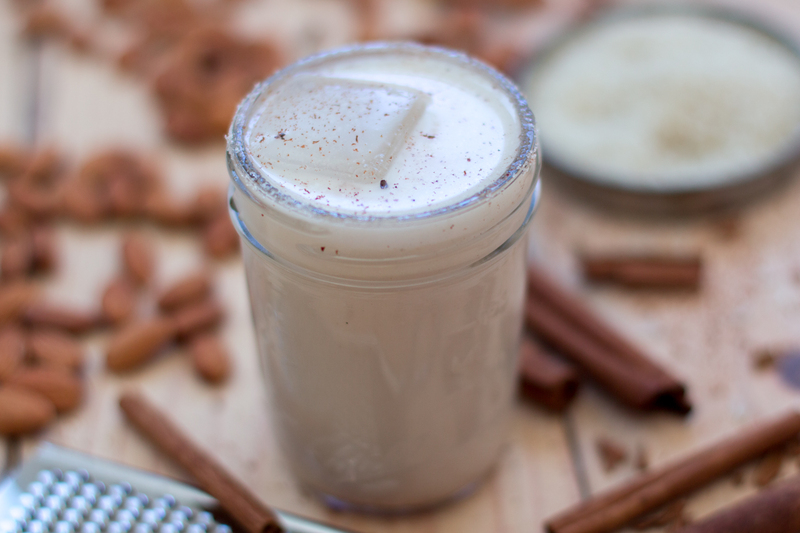 This seems obvious, all horchata should be vegan, right? It is a rice-based drink. But a lot of food bloggers (and even some taquerias) use real milk in their recipe. I’m not vegan, but that just seems… wrong. That’s okay, you’re about to make your own! This vegan horchata adds homemade almond milk to the mix, giving some depth and character to this summertime favorite. There's a pretty simple rule to cooking: the simpler the recipe, the better the ingredients. That is, when you're using just a handful of ingredients, the quality of those ingredients really matters. So I suggest a high quality, organic, long-grain white rice for this recipe. 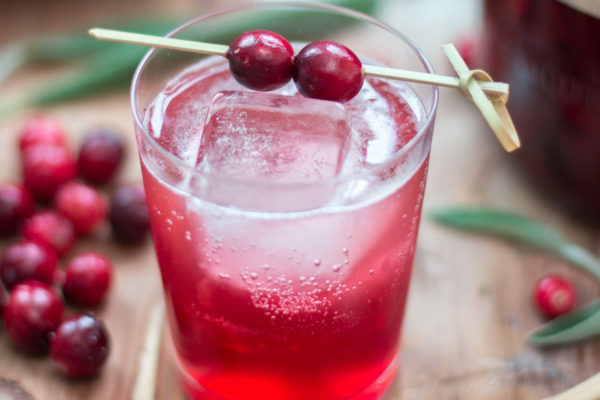 You'll get more of that lovely rice flavor in the resulting drink. Take the 1/2 cup of white rice and grind it up in the blender (or a spice grinder). Depending on the power of your blender, this can take a few minutes. To get an idea of how finely ground you want it, see the photo below, which has the original rice on the left and the ground on the right. Now we are going to blanch our raw almonds. This is to aid in peeling them, which, by the way, is the most annoying task ever. Thank God I love horchata because I could write a whole blog post on 8,000 other things I'd rather be doing than peeling almonds. Simply add the 1 cup of raw almonds to a pot of boiling water and let them cook for just a minute. They're done when most of the almonds have risen to the surface. 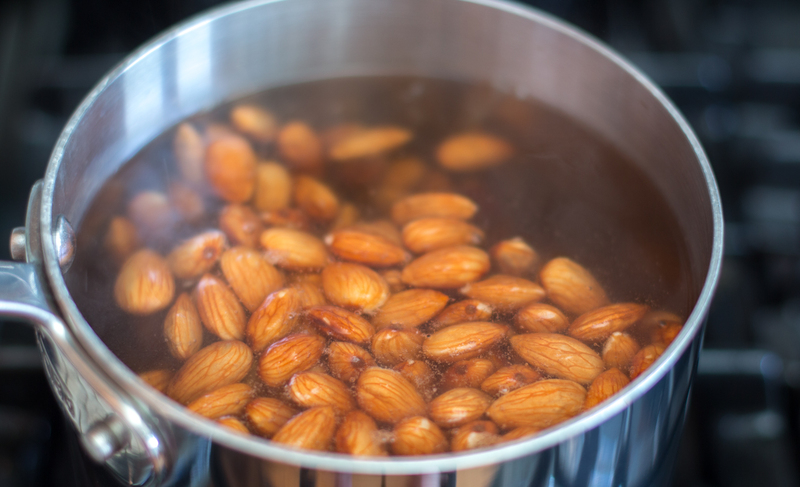 Strain the almonds and then rinse them under cold water. On to the peeling! There are a few ways you can do this. 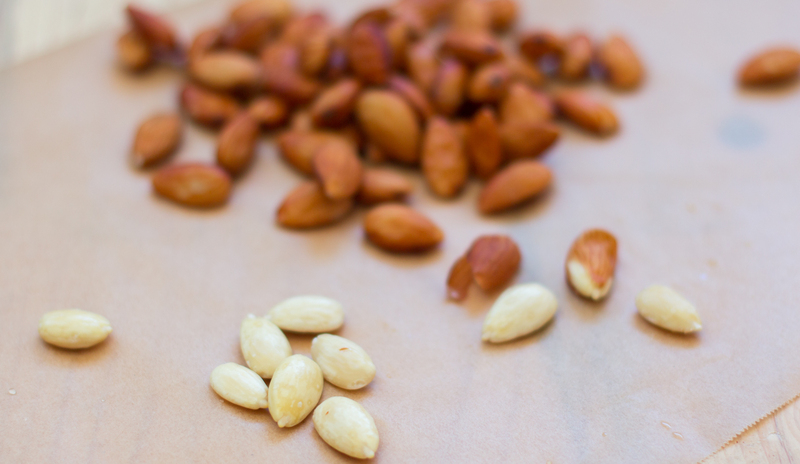 You can simply pinch each almond, which will quickly squirt the nut from outside its skin. The problem with this method is it takes longer, and the escape velocity on those almonds is deadly. Seriously, it's a good thing I wear glasses! Why am I telling you this? Well, this method is kinda fun. Like, in a schoolboy kinda way. The quicker method is to take 3-5 almonds between your hands (drying your hand each time to create friction), and rub your hands really quickly. This will dislodge most skins, making them easy to peel away. Why did that sound dirty? After peeling all the almonds (finally! ), wrap them in a paper towel and let them dry out. Then add them to a frying pan and lightly toast them over a medium heat. The moment you see a few of them brown, you are good. Add the 2 cinnamon sticks, the rice powder and the almonds to a large container and cover with 3 cups of hot water, stirring so that all of the rice is in contact with water. Let the mixture sit out at room temperature until cool. Then cover and let stand over night. Add the remaining water and puree the mixture in small batches, getting it as smooth as you can. Strain out the bits and pieces using a tea strainer, mix in the 1/3 cup of sugar and chill. 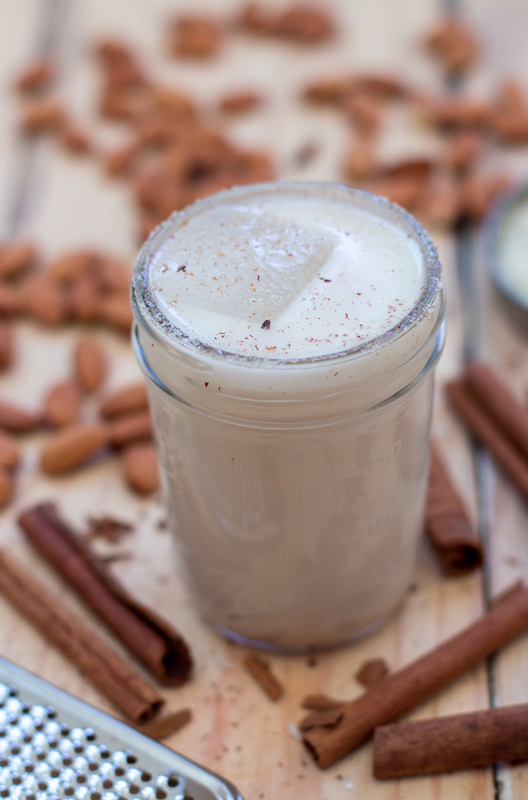 The horchata, not you. Serve over ice. I use about 1/3 the sugar that most recipes call for and instead rim the glasses with sugar and ground cinnamon. I personally feel this adds a fun touch to the drink, gives it that same "sweetness" but with less actual sugar.